A 1000 thread count sheet is almost always the best and highest quality sheet in existence – but not always. Don’t just accept what sellers tell you – or you may end up being quite disappointed. It is sad, but true. A 1000 thread count sheet can be even worse than some 500 or even 300 thread count sheets. The thread count is only one way of checking the sheets’ quality, but unfortunately there are some manufacturers who have learnt to circumvent it and make their sheets seem to be better than they actually are. 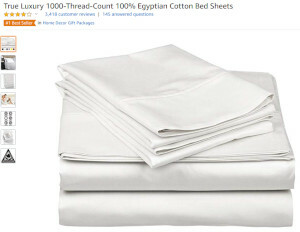 There are two ways of making a “false” 1000 thread count sheet without using outright lies. Here are two most common ways of doing that. It’s not literally a swindle, but it is certainly a sort of deception. A 1000 thread count sheet can be made of 2 plies of 500 thread count material. While normally manufacturers call such product “500 thread count sheet”, there are some unscrupulous sellers who count the thread of each ply together. Another common way of artificially increasing the sheet’s value is using low-quality materials. In order to keep the price as low as they can, they try to increase the thread count, which makes the cost considerably higher. To keep the price within limits, they try to use materials whose only quality is they don’t tear apart during weaving process. And a 1000 thread count sheet made of cheap material will never be as comfortable as it should be and it certainly won’t last as long as we deserve and expect. One way is to read reviews. For example, the 1000 count sheets listed above are #1 best sellers on Amazon and they have four stars from 3,418 reviews and 145 questions have been answered, many with multiple replies. I would certainly feel comfortable ordering those sheets, although I always make sure they have a return policy in the event that I don’t like them. Bottom line: do your homework before trusting the thread count label. You will save money and headaches in the long run.